So you are engaged and are preparing to take the most fun pictures ever aka YOUR ENGAGEMENT PICTURES! Ahhh so exciting, but let’s be honest… I think a lot of people would agree that when it comes to preparing for an engagement session it can be kind of scary & confusing. From figuring out what to wear to deciding where to take the pictures and knowing what to bring with you, it can be intimidating at the very least. Because let’s admit that most of us don’t get our pictures taken professionally on a regular basis and this is something new that you and your fiancé are doing together for the first time. And I want to say it for all the people in the back to hear that is perfectly okay. First question, where should we take our pictures? I get asked this question all of the time and I’m so glad when my couples ask for input on their session location. I always ask them if they have any ideas of where they want their pictures taken, but most importantly I try to ask my couples questions about what they want their pictures to feel like, what is important to them as a couple, and what kind of style they have. If they have somewhere specific in mind that is a special location to them, that’s great and we can definitely try to work off of that, but lots of times my couples really don’t know where they want to take pictures so it’s up to me to do some work to really get to know them and figure out what is important to them and where they are going to feel most comfortable and themselves. Brides, it’s soooo important to figure out where you are going to be comfortable and what is important to you as a couple. So with that being said, if you guys do not feel comfortable taking pictures in a public place & struggle with PDA, that is totally fine, but maybe downtown on a Saturday afternoon isn’t going to be the best place and time to take pictures where you feel comfortable and at ease. If my couple values the outdoor time they get to spend together and want their pictures to show how romantic and adventurous their relationship is together, then I would be doing them a disservice if I didn’t recommend some outdoor & secluded locations for us to shoot at. If my bride says she has a modern and unique style then I should probably brainstorm some locations downtown that would give her the look she’s going for and not recommend the places I shoot at more frequently. If I can give any advice to brides it is to be honest with your photographer and be as detailed as you can be about who you are, what are wanting to feel from your pictures, and if you have any fears or concerns about taking pictures. Your photographer can best serve you when they know you & more about who you are as a couple. And also, you can trust your photographer. Remember we do this for a living and work with people in this season all of the time, so we’ve got your back and truly want to get you the best pictures possible to commemorate this special season for you. Photographers, it is our job to not only communicate clearly and set expectations for an engagement session with our brides, but it is also our job to ask the questions and seek out that personal information and the details that are going to help us guide our couples throughout this season and give them the best, most personal pictures they could ever dream of. And ultimately, these pictures are for them and they are not about you or me. So even if your client has an idea in mind that might not be your favorite or your go to option of where to shoot engagement pictures, instead of shooting it down or offering some other places that you would rather shoot at without explanation, maybe try asking her why she wants to shoot in that place and what she likes about it and from there offer up some other spots that may work better for various reasons and explain what those reasons are to her (ex: more private location, shooting at a different time of day, etc.). This will show her that you are listening to her and care about what she wants, but you are also looking out for her best interest and have experience that can help make their session even better than they can imagine. Make sure you wear something you are comfortable in and that is flattering on your body type, with your skin tone, and for the weather/setting of the day. Compliment each other, but leave the matchy-matchy outfits at home. Instead, coordinate more subtly by wearing varying hues or shades of the same color or wearing colors that compliment one another (look up the color wheel and see the complimentary colors if you need to). Color coordination brings a balanced, easy feel to your photos. I do love some bold, fashionable colors every once in a while, but if that’s not your thing then stick to more earthy colors and neutral shades (black, white, denim) for the base of you outfit (these shades actually photograph super well on almost everyone). Also, you want to make sure your outfit style and colors are cohesive with the season and the location of where you are taking your pictures. Obviously you don’t want to be wearing a sundress in the middle of winter when it’s 40 degrees outside and there are no leaves on the trees. And if we are taking pictures in a field, maybe leave the high heels and wedges at home since we will probably be running around together. For color choices, I always always always recommend not wearing something that has a similar shade as your skin tone. So if you have a lot of red or pink in your skin tone, maybe don’t wear those colors in your outfit since it makes it more difficult to edit your skin tone naturally when it changes the color of your outfit at the same time (same with orange and yellow skin tones/colors). Try wearing colors that compliment your skin tone rather than match it. Bold, pops of color can be fun & reflect your personality, but just maybe leave the super distracting patterned outfits at home. You guys should both look like you are going to the same place when you pick out your corresponding outfits. The best way to do this is to match each other’s level of dressiness or casualness. If guys are going to wear a suit & tie, then ladies should match their level of dressiness with a nice skirt/dress outfit. If a girl is rocking some jeans and a cute blouse for a more comfortable every day look, make sure your guy is comfortable in what he has on and it reflects his personal style too. This will make your pictures 10x better because you will look so much more put together and your outfits will naturally coordinate with each other. You can coordinate your outfits this way whether you are dressing up or dressing down for your pictures! If you’re debating between outfits just bring your extra choices with you. We can take a look at everything prior to getting started and make decisions together if you aren’t sure what you want to wear. We'll consider location, dressiness, & comfort level to help decide what will be best. And you can always bring options so we can do a couple of different looks for you guys during our shoot. It never hurts to be overly prepared when it comes to outfits! My best advice if you’re nervous about taking pictures is to think of this as a date versus a photoshoot. So it’s something fun that you get to do in order to spend time together! If you’re still a little nervous, don’t be afraid to tell your photographer that so they can encourage you and help you feel comfortable. I like to offer to meet my couples beforehand (especially if we don’t know each other super well) for coffee or to grab drinks just so we can hang out and talk for a little bit and get to know each other as friends and then when we go to take pictures we all know each other better and might have some liquid courage or caffeine in our system, which can be surprisingly helpful! As you are taking pictures, try to think of it more as hanging out and having fun with each other. Keep moving (your hand, your gaze, your hair), because the more relaxed and at ease you are with each other, the more that will shine through in your pictures. Don’t be afraid to kiss each other, touch each other’s hair, whisper in each others ear… these little things breathe so much life into pictures and they are all just ways to flirt with each other and show each other your love. This is the time to let your goofiness or sweetness come out with each other, so just be yourselves and pretend the camera isn’t there. Don’t hold back or worry about the PDA, remember your photographer takes pictures of people making out all the time so it’s definitely not going to be weird for them to take pictures of you guys being all cozy and cute together if that’s who you are! Just get out of your own head, be present, look into your person’s eyes and enjoy this sweet season you are getting to document through these pictures & celebrate that you are about to get married to the love of your life! A note to photographers: Taking pictures can be super intimidating for a lot of people, and not every couple is the same. So as much as you may want to get a perfect “Instagram” shot, you need to truly get to know your couple in order to figure out what prompts/poses are going to be comfortable for them and really showcase who they are as a couple. Some people are silly and goofy and playful while others are intimate and romantic and sweet - and that’s totally fine! In fact, it’s great that everyone is so different or else we would all be taking the exact same pictures all the time. Do the relational work before you ever take their pictures. Start with emailing questions that will help you get to know them for who they are as a couple, what they value, and what they want their pictures to reflect. Then meet up before the session to hang out and get to know each other even more and get comfortable with each other. And as you are taking pictures, keep in mind what you’ve learned about who they are what they enjoy together and what they want to shine through in their pictures. Let all of these things help you guide them through the shoot with the prompts that you use and the things you have them do. Focus on capturing their reactions versus just the action you tell them to do! And lastly, constantly encourage your couple because they are doing great and encouraging them will help them feel good about themselves, more comfortable with you, and excited about taking their pictures! 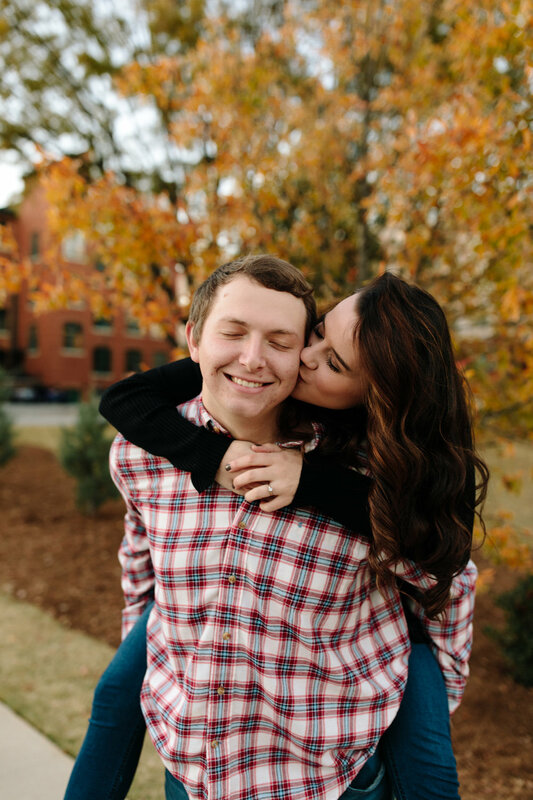 Whether you are a photographer or a newly engaged gal planning your dream wedding or you are just taking some fun couple pictures with your significant other, I hope these tips and advice have been helpful to you! Inspiration for engagement sessions !! !